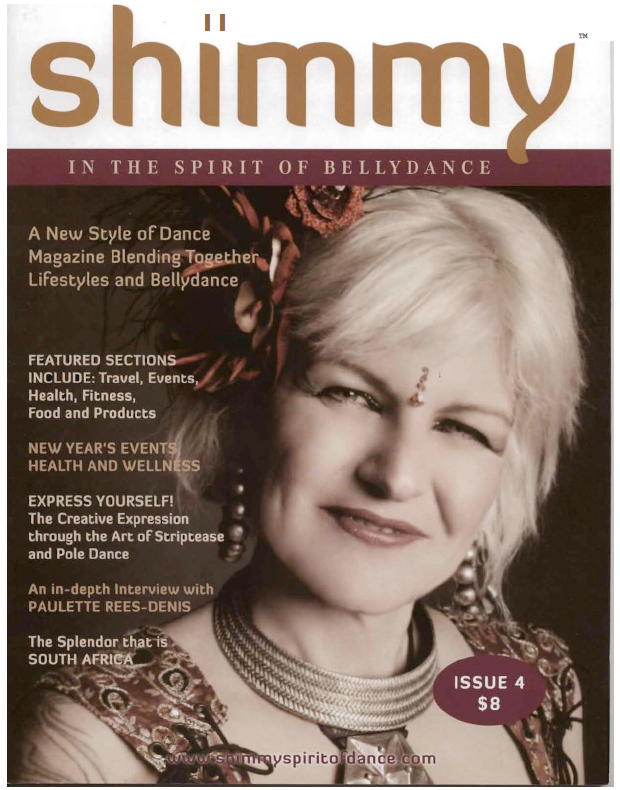 I have been very blessed working online with the creator of the GYPSY CARAVAN TRIBAL BELLYDANCE format, the always inspirational, charismatic, loving, PAULETTE REES-DENIS. Not only the stunning curriculum of her COLLECTIVE SOUL online graded levels, but also the life-changing DANCE AND DESIRE, in which all aspects connected with belly dancing are explored. To be able to attend workshops with Paulette, to see, speak and learn from in person was an opportunity that when presented, was one I would not miss!!!! As you can imagine, all those involved in the ROTORUA ODYSSEY 2016 were wishing the weeks away, waiting for the arrival of Paulette from Portland via our Australian GYPSY TRIBAL sister dancers!!! The variance of workshops facilitated by Paulette was incredible!!! Clearly a lot of thought, preparation, love, and passion had gone into the weekend workshops, as well as for the tribal sisters working towards their COLLECTIVE SOUL levels during the 2 weeks of Paulette’s visit, AND teachers training certifications!!! Those wonderful ladies who put themselves forward to expand their knowledge and love for this form of Tribal Belly dancing, were guided by Paulette through all facets of learning and self-discovery, organically gaining not only additional Gypsy Tribal technique and moves, but grow as dancers and as people with strength and confidence, allowing their hearts and souls to be totally open to all the experiences that came with it. What an amazing opportunity to be taught by our Tribal Mother, our mentor and creator of Gypsy Caravan Tribal, to have first-hand knowledge and guidance, to hear and connect with the person who can evolve you and your dance into so much more than you would ever imagine. They say you never forget your first time. And trust me I won’t! I have to quietly admit that I was once a Tribal Gypsy Caravan virgin but have no fear (thanks to the beautiful Christine and MEDANZ) the invigorating Paulette Rees-Denis and elegant Nina Martinez “cured” me and I’ll never be the same again! I didn’t know what to expect but with a whole day of traditional gypsy caravan tribal technique, rhythms, zills and tribal combinations/variations ahead of me I got more than I bargained for. My lack of experience did not hinder my enthusiasm to learn in the best supportive environment. Coming from an oriental background these workshops took the ‘darkness’ out of Tribal belly dance for me. I was able to intuitively use cues and combinations to connect with my fellow dancers, even as a first time tribalist! It was great being able to see what felt “natural” and what moves/combinations would make my head explode! That’s where Paulette and Nina came to the rescue, with their excellent breakdowns, encouragement and smiling faces. I couldn’t believe the day had come to an end so soon. I was just getting started! What I thought of and how I saw Tribal Gypsy Caravan changed after this rewarding day. It may channel the ancient times and Tribal spirit but it’s always on the move. Travelling around the world, bringing dancers together to make magic happen. Paulette and Nina were able to teach us more than the moves written on the notes we took home. They taught us the history, the feeling and the dance of today. These ladies know their stuff! My only wish is that they’d stayed. H: What draws women to Tribal Style? P: The community aspect of dancing together and connection with each other. Our world is calling for community of any type. We need to learn from each other and have fun together and admire ourselves and ac?cept ourselves. It’s exciting to be a dancer and move your body energetically (on a woo­woo level) as well as physically. I think a lot of people are drawn to it because movement is exciting and healing. People are attracted by the costumes, the music, the spiritual side of dance, the emotional release. Tribal also helps women accept themselves as they age. That’s what makes it so damn cool…everybody should just dance! 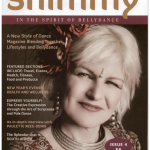 By Paulette Rees­-Denis / Gypsy Caravan Dance Co.
What is it about our fabulous dance style of Tribal, with its plethora of fusion evolutions, which continues to mesmerize us, to pull us toward it and into it? When you watch it, you see the astounding beauty, the connection through the eyes, the smiles, and the movements that the soloist or group of dancers share. It has that so-in-the-moment kind of energy, as if nothing else exists right then. You can feel the power, the soul, sometimes the ancientness, the collective energy, and you want it too, to be a part of it, to feel it. As dancers and artists, we feel the strength, the empowerment, the sensuality and the beauty, as we move our bodies to that innate rhythm inside. The pulse of life. It feels good, it looks good, and it does make us strong—physically, emotionally, and mentally. It can be all for fun, to get fit and just dance, have some laughs, and hang out with your friends. Or it can take years of commitment and training to get to a professional performance level. Whatever your personal goal is, the dance is yours to do and share as you desire. The body blossoms, the soul explodes with the mind/body connection, and the interweaving of each other is inspiring and energizing. It is marvelous to have control, flexibility, and groundedness in the body, to be able to move it, to feel healthy and alive, and to absolutely love being in your own skin! I’ll admit that the first three or four times I picked this book up I did nothing but look at the photos. 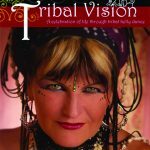 Even though I own The Tribal Bible­­, which is a pictorial buffet itself­­the numerous gorgeous pictures in Tribal Vision were so fantastic that I had trouble reading the text. Every dancer I saw seemed clothed in layer upon layer of earthy, textured finery. While the Internet abounds with photographs of dancers, printed copies are rare. And color! They’re in color! Even the ones in black and white were so lush and inspiring that I picked my jaw up off the floor, grabbed for my sketch pad, and started drawing new costume and makeup ideas. Once I was able to calm my visual center down enough to actually read the book, I was absolutely hooked. It was my first in­depth introduction to Paulette, as I come from a FatChance American Tribal Style (ATS) background. I knew nothing about her, and very little about Gypsy Caravan (her troupe) other than that it was another form of improvisational dance. The book begins with Paulette’s background, and then spreads out into many other aspects of the dance, including the history of ATS, costumes, performing, music, and teaching. Rather than serving as a how­to book, this text is more a moving, growing memoir infused with useful information for anyone interested in group improvisational dance. I was also delighted to read about Paulette’s experiences as a teacher. This sort of firsthand account is, again, difficult to find. It was inspiring, to say the least, and made me appreciate the teachers I had worked with all the more. Tribal Vision is a wonderful book. For improvisational dancers, it provides a history as well as inspiration for the future. For non­improv dancers, it’s an interesting glimpse into the sisterhood. And did I mention the photos? You won’t find any high­tech lighting effects, flashy introduction, or elaborate sets in this DVD. The lighting and background are basic, and there are no sophisticated camera angles. Don’t expect to be overwhelmed, either, by a tribal dance star so glamorous that she seems to come from another world. Instead, you will find that Paulette has a down­to­earth personality. The whole DVD has a comfortable feeling of camaraderie and sisterhood that is liable to make you feel that you are in your best friend’s living room, rather than in the presence of an internationally known belly tribal dance star. The subtitle of this DVD is “Snappy Intermediate Combos, Turns and Partnering Ideas.” I would agree with the title. Paulette, Nina and Sienna partner very well, whether they are facing one another, both facing the audience, or dancing with back to the audience. Transitions such as change in lead dancer are seamlessly woven into the combinations. Paulette continues to demonstrate her mastery in creating combinations that allow two or three dancers to work together with fluid motions that are reminiscent of the waves in the ocean. This DVD comes hot on the heels of the No9 and from a different continent, Australia. This variation on settings adds to the Taking Tribal Global message and does have a different feel with Nina Martinez (a member of Gypsy Caravan Dance Co International) and guest Sienna emphasis the message that this truly is a global dance language. Again a full warm­up starts the DVD off, which is good to do and get ideas for your own teaching, and then into the moves. Some of the moves and partnering ideas Paulette has taught previously in workshops so it is good to recap these and correct some of the detail, and have them on film. And again both sides of the body are used for the brain­body challenge! Nina does a lot of the work here as Paulette dances then stops to point out the details. There are also some moves and combinations that change a little as dancers get more advanced so it’s good to look out for these. 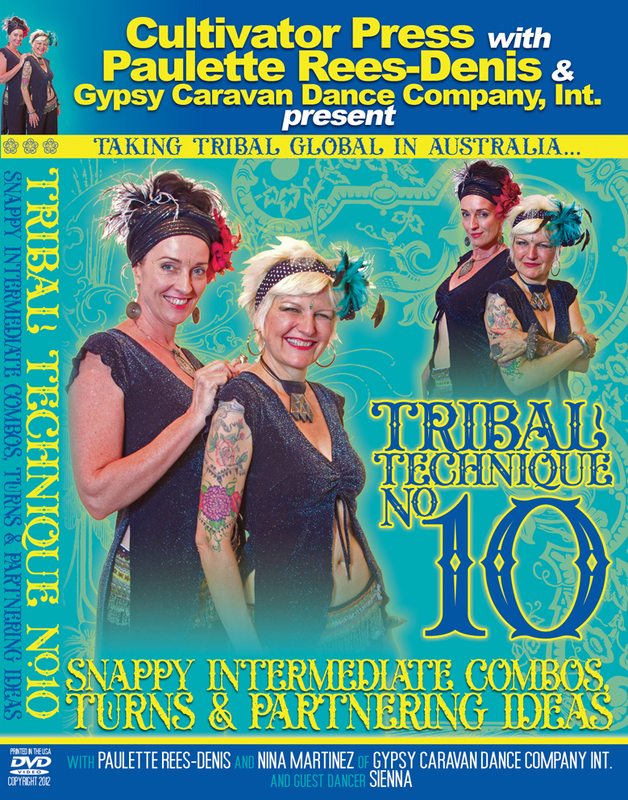 I have been studying with Gypsy Caravan for 10 years now and still felt the DVD offered me updates, new combinations and I particularly loved the partnering ideas including the new Shimmy Around. With a practice session with an additional dancer again the facing/facing away route is shown and very helpful. I particularly enjoyed this one as other Gypsy Caravan moves are introduced in the session and the dancers improv is impressive. 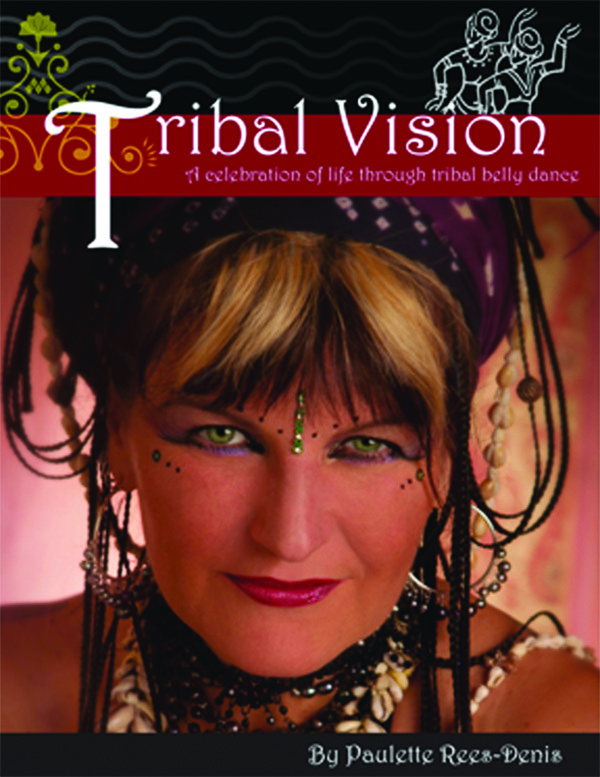 The discussion and slideshow at the end of the DVD again reinforces Paulette’s style of tribal, taking care of yourself as a dancer and the power in this dance.